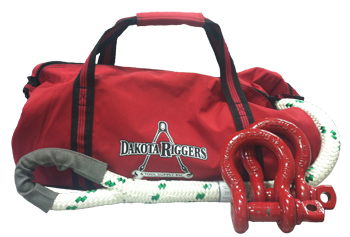 Now available in a convenient kit, includes a 1" tow rope, two 1" shackles, and a storage/carrying bag! Our 2-in-1 type tow ropes have proven to be the most reliable and efficient type of pulling and tugging ropes in the industry. We provide tow ropes to a variety of users including agriculture, construction, land fills, utility companies, and sportsman to name a few. The 2-in-1 type ropes provide a unique energy stretch that absorbs much of the shock load that occurs in pulling applications and assists in recovery type situations.